If you are really planning to visit Kefallonia and not just interested in the movie you should probably save this page because from here on in it is like a real travel guide. Kefallonia, or Cephalonia, is the largest of the Ionians, the string of islands to the west of mainland Greece and the Peloponessos, favored by many for their proximity to Italy and the rest of Europe and the lack of Meltemi winds in the summer. It is a green island, not as wet as Corfu to the north but rich in vegetation and in the spring the hills and fields are alive in a variety of wildflowers. Like Zakynthos to the south, Kefallonia is a nesting ground for the loggerhead turtles which lay their eggs on the southern beaches in June, and the Mediterranean Monk Seal, the rarest of seals and one of the six most endangered mammals in the world. The island has 27,000 inhabitants, some who are fishermen, some who are farmers and an increasing number who are now in the tourism trade or will be soon. The main influences of Kefallonia, like the rest of the Ionian islands is Italian since the Venetians controlled it for almost 300 years. These influences can be found in the cuisine, architecture, art, literature and music of the island and in fact the Kefallonian's were playing the mandolin at least two centuries before Corelli picked it up. The two main towns are Sami in the northwest part of the island close to the island of Ithaki, home of Odysseus and Argostoli in the long Gulf of Argostolis in the south. Because of the island's proximity to Italy it is flooded with Italian tourists in July and August. Add to this a large number of package tourists and you will discover that it is nearly impossible to find a place to stay during those two months and the situation is not likely to improve should the previously mentioned film be a success. The best advice for traveling there in late July and August is don't bother. But if you go there in the off-season you will be rewarded with one of the most beautiful and fascinating islands in Greece. Argostoli is the capital of theisland, a new city which was built after an earthquake destroyed the old one in 1953, not the first time the island has been hit and probably not the last. The British built an arched bridge over the Koutavos Lagoon that connects the city with the rest of the island. There is a Museum of Archaeology on Rokou Vergoti Street, up from the waterfront with a collection of Mycenaean relics from the excavations around the island. A few blocks up is the Historical and Cultural Museum which contains many relics of the British and the various occupiers of the island, as well as traditional costumes, furniture and tools. The main harbor of Argostoli is a lively place with a market on Saturday and lots of restaurants including the Taverna Diana, Taverna Kalafatis and the Anonymos, all recommended by the kalofages at Lonely Planet who also recommend Patsousas, El Greco and Tsivres Brothers for their island cuisine which is distinctive due to it's many foreign influences. They also recommend the local Robola wine. The main square is Platia Valianou, lined with tavernas, cafes and shops and there is a children's park right next to it. There are a couple of beaches in the vicinity of Argostoli called Makri Yialos and Plati Yialos which can be reached on foot. Both are very nice beaches but like most town beaches can be crowded in the summer. There is plenty of nightlife in Argostoli from rock and disco to bars and cafes where you can have a quiet drink and conversation. Across from Argostili is the town of Lixouri , the second largest town on Kefallonia which was built in 1534 and destroyed by the 1953 earthquake and rebuilt. It is visited mainly because of the museum and library of the Lakovates and because of its proximity to several beaches. You can reach Lixouri by ferry and if you have a car or rent a motorbike from one of the many shops, you can explore the rest of the western peninsula or visit the beach of Petani , said to be the best on this part of the island. Near Lixouri and of very special interest is the place called Katavothres , which means pits , where thousands of tons of sea water pour into the earth and disappear, passing under the island and filling the lakes of Melissani and Karavomylos near Sami. Sami is the main port of the island and like Argostoli it was also destroyed by the earthquake and not restored to it's previous beauty. There are Classical and Roman ruins in the area but the main reason people come here is to see the nearby Caves of Mellisani , a sea water lake which was discovered when the roof collapsed and the sun revealed the beautiful turquoise water, and the Drogarati Cave with it's long corridors and impressive stalactites. One of it's caverns is said to be acoustically perfect and in the summer concerts are held here. Both caves are within a few miles of Sami and there are signs posted. They are open all day and there is an admission charge of 700 drachma. There are rooms, hotels and camping in Sami and along the coast. The fishing town of Fiscardo is a favorite of yachters and flotillas and is also an artist colony and was the only village not devastated by the 1953 earthquake. Once a quiet village it has now been 'discovered' and the lobsters which were so easily found and caught by anyone with a mask and snorkel and flippers have now become rare and only found in the local fish restaurants. Because it was spared the destruction of the earthquake many of the old Venetian buildings still survive and in the off-season it is a beautiful and enjoyable place to visit. But like most of the island, July and August can be a frustrating time to be here. (more on that later). Hotels are a little expensive and generally unavailable during the tourist season. Restaurants are reasonably priced and most are around the waterfront. Frommers recommends the Faros, while Lonely Planet recommends The Captain's Cabin and Taverna Nicolas, but hint at the near impossibility of finding a table in the summer unless you get there early. The west coast ofthe island is known for having the best beaches as well as the most beautiful landscape. If you start at Fiscardo and travel south you will come to the village of Assos with it's port, one of the most picturesque in Greece, pastel colored houses and it's Venetian fortress. Nearby the beach of Myrtos(photo) is one of the most spectacular beaches in Greece with tall cliffs and white sand and the color sea that most travelers are seeking when they come to the Greek islands. If you continue along the coast there are many more small coves and beaches but most of them are accessible only by boat. According to my pal David Willett, formerly of Lonely Planet, in the village of Markopoulo a miracle occurs every year. On the 15th of August, the saint day of the Panagia (Virgin Mary), and the second holiest day in Greece, the village church becomes infested with small snakes with crosses on their heads. The snakes are non-poisonous and are said to bring good luck to the village. As mysteriously as they have come, they disappear until next year, same time and same place. But according to a woman who grew up in Kefalonia this is a little misleading "The snakes are about 5 to 10 and they come out from 6th of August to the 15th on the rocks and the villagers collect them.This phenomenon not only happens in Markopoulo but also in an other village up the mountain called Arginia." The ruins of Kastro above the village of Peratata , 9 km south-east of Argostoli was the capital of the island in the middle ages and has a 13th Century Castle of Saint George. Near Perarata is Lourdata beach which offers horseback riding. There is also a beautiful two and a half hour nature walk. You can get a trail map from the EOT (Greek National Tourist Office) in Argostoli. Metaxata is where Lord Byron stayed for four months before going to Missolonghi to fight in the Greek War of Independence and become a martyr.It was here in Metaxata that he wrote the poem Don Juan. Skala on the southern tip of the island is a tourist resort as is Poros. But there could be more to Poros than meets the eye. 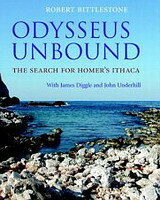 The discovery of a large grave has convinced a few people that this was the grave of Odysseus and that Poros, the site of an ancient city much larger than anything found on the neighboring island of Ithaki, is perhaps the city that the hero of Homer's Odyssey was returning to. The grave was full of gold jewelry, which generally means it was the final resting place of a king, (or kings). These can be seen in in the Archaeological Museum in Argostoli. Among them is a gold brooch, described by a disguised Odysseus to his wife Penelope to assure her that he had seen her husband (himself) on the island of Crete. Odysseus' descriptions of his beloved Ithaki bear a striking resemblance to Poros with the Cave of the Nymphs being a days walk (you can drive now) and the views of the tree-clad Mount Neriton which might be Mount Aenos just above Poros. So is Poros the ancient Ithaki? If anyone knows for sure they have not said so yet. Maybe the best thing to do is read the Odyssey and then visit Ithaki and Kefalonia and decide for yourself. You can find many hotels in Kefalonia by location, price, whether or not it has a swimming pool or is on the beach, and see photos, maps and customer reviews by using this link to booking.com. Excellent prices and many hotels you can book and then cancel with no cancellation fee. 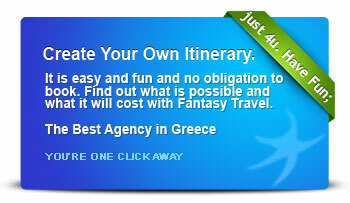 For those who want to book without using a travel agency this is the best way to do it. There are a few hotels listed here for Kefalonia. Do you enjoy using my site? Have you found it entertaining as well as useful? If so please show your appreciation by booking hotels and homes through the travel agencies and the links found on this page and on my Greek Travel Agency page. The small comission I make on the bookings enable me to keep working and in most cases you won't find them any cheaper by searching elsewhere. You can find hotels, apartments, rooms and even houses through Booking.com's Kefalonia Pages which also contributes to my website when you book.